All Kum-Ji wants in life is to meet her favorite boy band, DDL. When she finds that the roster for the fan club is full, Kum-Ji despairs on ever having the chance to meet them face to face. Just when she believes all hope is lost, she decides to con her way into the boy band circuit by faking an interest in another band, Yo-I, and joining their fan club. Once in, she will have access to other bands, including her beloved DDL, who often plays the same shows. However, the best laid plans so frequently go awry, and her deception is very quickly discovered by one of the band members, E-Soh. E-Soh originally decides to blackmail Kum-Ji into doing whatever he wants, but he never planned on falling in love! 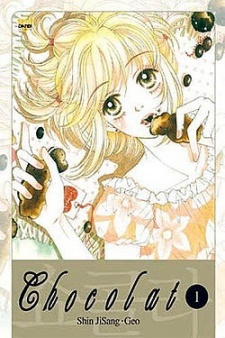 Chocolat was published in English by Yen Press from November 2, 2005 to December 11, 2012 with the final volume published as 3-in-1 omnibus edition. Yen Press also published the manga digitally on March 26, 2013. 1.the storyis verry easy to understand. even someone really stupid(sorry for the offensive word) can understand. since there is only a few reasons not to like this manga, i strongly recommend you to read it. Where can I buy volume 8?